Nature can be cruel, and the Tom Fun Orchestra's video for "Earthworm Heart" reminds us of that fact in rather fantastical fashion. 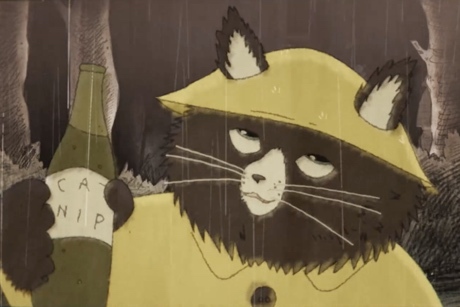 The animated clip for this folk rock shanty begins quite cutely, as a cat goes fishing with a rod while wearing a yellow rain jacket. Things take a very creepy turn, however, as the kitty gets drunk on liquid catnip, is chased by ghostly worms, and ultimately gets gorily feasted upon by birds. It was directed by Alasdair Brotherston. Watch it below. This song comes from the band's album Earthworm Heart. Earthworm Heart from Trunk Animation on Vimeo.